This is a double recipe, by the way, in case you were looking at the picture and thinking ...that's a pound of brussels sprouts? Today this is going to be served as a side dish to a turkey, Happy Thanksgiving by the way! For everyday it can go next to rotisserie chicken, or have quinoa mixed in a la quinoa with root vegetables. Put the cranberries in a small bowl with enough tart cherry juice to cover. Trim and halve the brussels sprouts. Today I have pearl onions in this; but let me tell you, they took a half hour to peel. Maybe you just want to roughly chop a regular onion, or omit the onion. 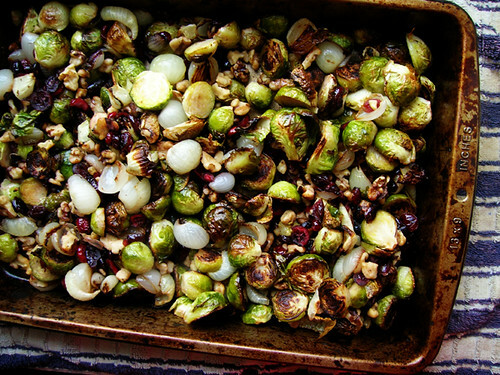 Toss the sprouts and onions in a baking pan with olive oil and salt. Roast the sprouts and onions mostly cut side down for ten minutes. Drain the cranberries, and by "drain" I mean drink the tart cherry juice. I'm guessing at most of these roasting times because I'm actually sitting next to the oven drinking tart cherry juice and reading my google reader, and taking things out of the oven when they smell done. Brussels sprouts, though, roast way faster than root vegetables, just so you know. Stir up the sprouts and onions so they're mostly cut side up, stir in the cranberries and walnuts, and roast for five more minutes.